"These are the nicest boards I've seen in a long time"
"Love your boards. They look fantastic." "Art collectors and water lovers everywhere are sure to appreciate the fine craftsmanship of each unique, and surprisingly affordable art piece. 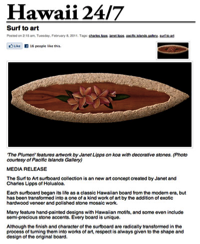 In no time at all, these boards will gain the worldwide recognition they deserve."